The Kindle Touch launched in the United States over four months ago. Then at the beginning of February it went international, but only the Wi-Fi model. Now Amazon is finally rolling out the 3G model of the Kindle Touch internationally, and they’ve also added it to their regional stores so not everyone has to buy it from Amazon’s US website anymore. In addition to the international launch, the Kindle Touch is getting support for more languages, including German, French, Italian, Spanish, Brazilian Portuguese, and of course American or British English. Amazon UK has the Kindle Touch for £109 and the Kindle Touch 3G for £169. From the other European Amazon sites the regular Kindle Touch sells for 129 euros and the 3G model is 189 euros. I’d personally recommend saving some money and just going with the Wi-Fi version. The 3G only connects to Amazon, Wikipedia, and Shelfari; it no longer connects to the entire internet for free. You’d have to get the Kindle Keyboard 3G for that feature. The pre-orders are expected to start shipping on April 27th. 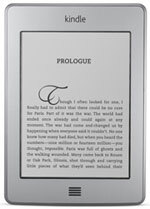 The Kindle Touch ships to over 175 countries. If you live outside the delivery boundaries for those countries you have to order from the regular Amazon US website and choose your country from the drop-down list. And don’t forget to check my Kindle Touch 3G review for more information about the device.